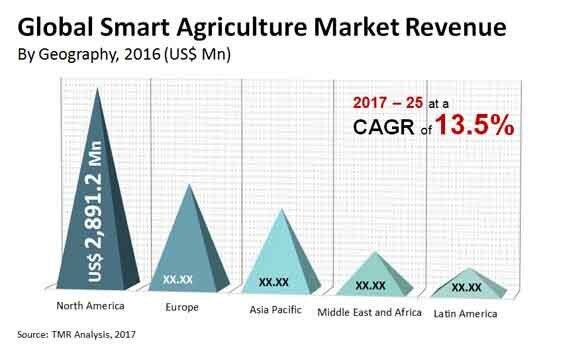 The global smart agriculture market has a fragmented vendor landscape due to the presence of a large number of players operating. Competition among the players is likely to increase as new players enter the market. Leading players in the market are focusing on technological advancements and expanding their product line to strengthen their position in the market. These players are also adopting various strategies such as mergers, collaborations, acquisition, and expansion gain competitive edge in the market. Raven Industries Ltd., SST Development Group Inc., TeeJet Technologies, Trimble Navigation Ltd., and AgJunction Inc. are some of the prominent players of the market. According to Transparency Market Research (TMR), the global smart agriculture market is expected to rise at a staggering 13.5% CAGR over the forecast tenure between 2017 and 2025. The market is expected to touch US$23.44 bn by the end of 2025 progressing from US$6.55 bn earned in 2016. The demand for network management solution increases as it deals operations such as remote monitoring systems to enhance agriculture production. Smart agriculture equipment also helps in analyzing data generated from the agriculture fields. Based on regional analysis, the demand for smart agriculture is increasing considerably in Asia Pacific. This is because some of the key countries in Asia Pacific like China and India are largely involved in agricultural activities thus creating lucrative growth opportunities for this market. Globally, the demand for cloud based services, GPS, Internet of things, and other similar technologies are used vastly since last few years due to the technological changes that are taking place. Supportive government policies are likely to create lucrative growth opportunities for the smart agriculture market. Rising adoption of artificial intelligence and internet of things by farmers is also likely to drive the smart agriculture market. Growing adoption of modern agriculture techniques and rising need to track livestock and disease detection are also pushing the demand for smart agriculture equipment. Furthermore, the rising population of tech-savvy and well-educated farmers, growing concerns for decreasing arable land, and availability of advanced agriculture machines and associated technologies are likely to provide a fillip to the smart agriculture market. Though the demand for smart agriculture is rapidly increasing across the globe, certain factors are restricting its expansion to an extent. Limited knowledge among the people involved in agriculture activities about benefits of using smart agriculture. The high cost of installation of smart agriculture equipment and lack of standardization in smart agriculture are some of the main factors restricting the growth of the market. Moreover, issues related to data management and data aggregation is considered to deter market’s growth. However, integration of smartphone with hardware and software applications and the introduction of big data in agriculture farms are expected to increase the demand for smart agriculture over the coming years.